Welcome to Vicarage Quilts - thank you for visiting. 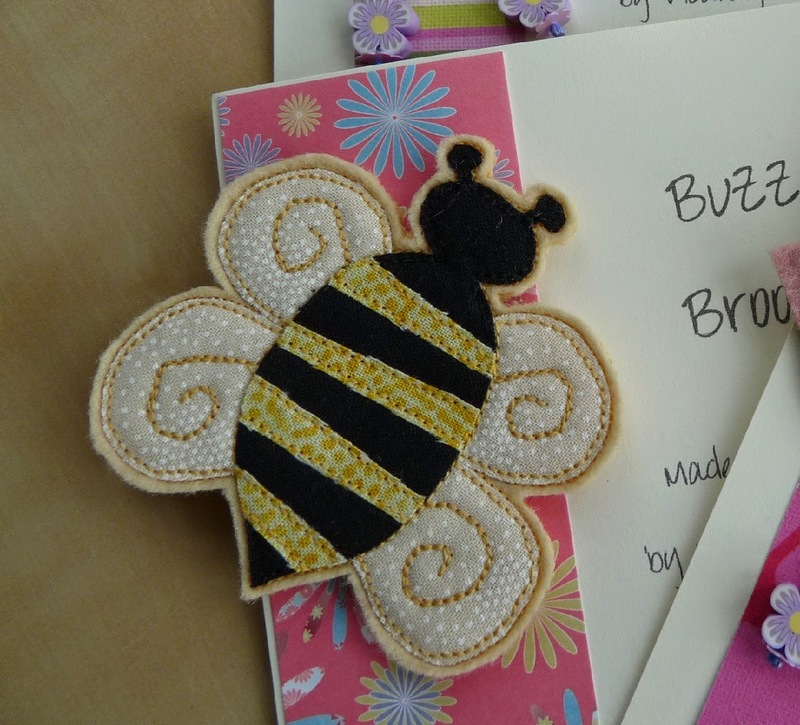 I offer several services: longarm quilting, patchwork and appliqué workshops and small items made to commission. In the past I've also made quilts to commission as well as Church or School banners for Walking Days and permanent display. Please visit the pages listed on the right hand side to find out more and email me with any queries. What happened to April and May?! ...these are officially the cutest brooches in the world. Especially en masse, or in pretty glass dishes. They were quite hard to give away. I may have to make more so I can put lots in a glass dish and look at them. Or not because, you know, I am a responsible grown up. I made some felt brooches as well: dogs and birdies and one rather spectacular bee, because they were quicker than bunnies. Stitch and Chat nights (this is March but they happened in April and May too, it's just that I wasn't so handy with my camera when it came to it...). There was an Advent Calendar workshop sometime in May, you can see the sample hanging on the curtains at the back of the photo above. I forgot to take photos then too, bad me. ...the banner for Oakwood Avenue Community Primary School (yes, you do have to say all the words because I had to sew around every one of those letters. Lots of them are the naughty letters with holes in them, so that means you have to sew around the inside of the hole too. That's like two letters in one. My machine played up like you wouldn't believe and I had to use the machine that's supposed to be the less-good machine instead. Which also played up, but in a manner for which I could compensate. I did not enjoy this part of the banner, can you tell? Liked this bit though. I also got to say quite often, "I'm just going home to make a child," which I found amusing. 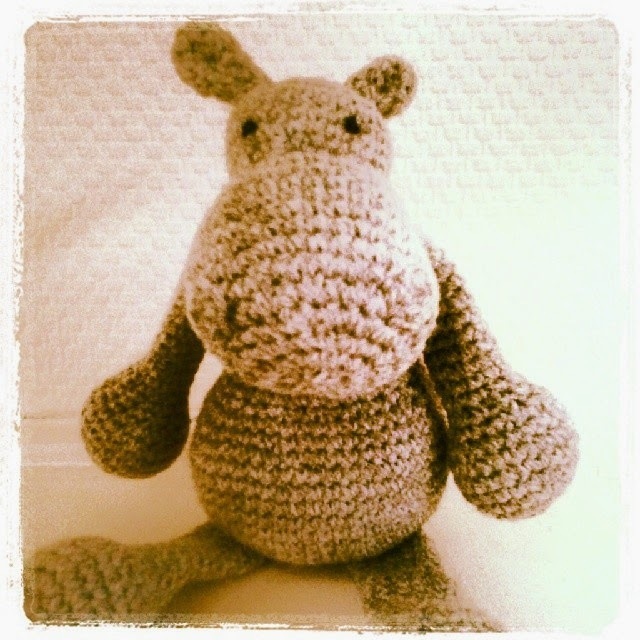 ...finally, vying with the bunnies for the title of 'cutest things I made since I blogged last', crocheted animals from the Toft Alpaca book. This dude is my favourite, but he's gone off to make a little chap sleep better, so I think a replacement is in the offing... I have lots of time now, right? Emma made a lap quilt for the Golden Wedding Anniversary of some friends of her parents, and this weekend I quilted it for her: no time to wait around as the anniversary's in a week or so. The fabrics are in lovely spring-like colours, all very fresh. The backing fabric is a coral batik, very luscious! You can see it here on the take-up roller. In the centre of the quilt is a foundation-pieced heart. Emma asked for hearts in the quilting initially, but the fabrics are all so heavily patterned that the quilting wasn't really showing up very well. I changed to wiggly cross-hatching in the corners, curvy echo quilting around the edges, a bit of custom work in the central block and a large feather wreath on point in the main body of the quilt. In the early morning light the quilting shows up in relief very nicely here - it's a pity you usually have to look at the quilt from a funny angle to see it! ... here's hoping the recipients like it! Believe it or not, this quilt was started in Hong Kong thirty years ago. It came back to the UK as a patchwork top, in a carrier bag from Oliver's of Hong Kong, when its owner and her husband returned after two years there with the British army. It was pieced by a Chinese lady, partly on a treadle sewing machine, and contains fabrics from dresses belonging to Sandra and her little girls. 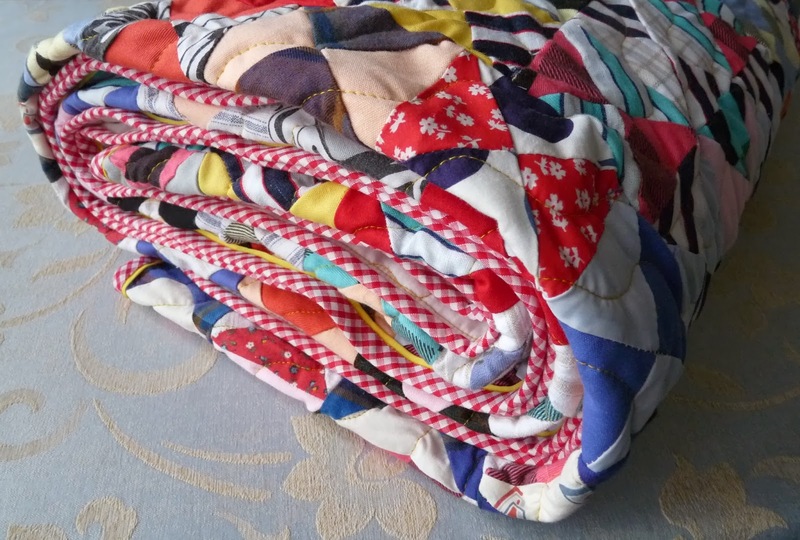 For thirty years, it's been in its carrier bag in a wardrobe - until Sandra realised I had a quilting business, and asked me to quilt it for her. It's a substantial top, not least in size but also in the fabrics used - they aren't all patchwork cotton weight by any means, and some of the seam allowances defeated even my beast of a machine - there was a lot of swerving around the bulkier areas where several points meet! It also had a rather cavalier attitude to the notion of geometry - nothing was really straight, or perpendicular, or even matched up. 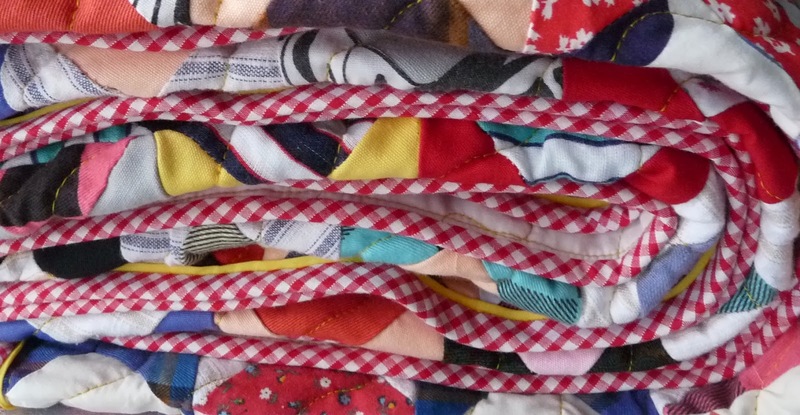 However, what the maker lacked in technical expertise she made up for in the lovely exuberant colours she chose for each tiny hourglass block: it really is a bright and cheery quilt that makes you smile. This quilt was rather a labour of love. I had to repair a few patches and re-sew the odd seam before I started. The quilting pattern I originally chose had to be unpicked because the extra fullness in the quilt top really didn't agree with it, and I needed to re-think, unpick, and then select a pattern that allowed the fullness to go where it would... 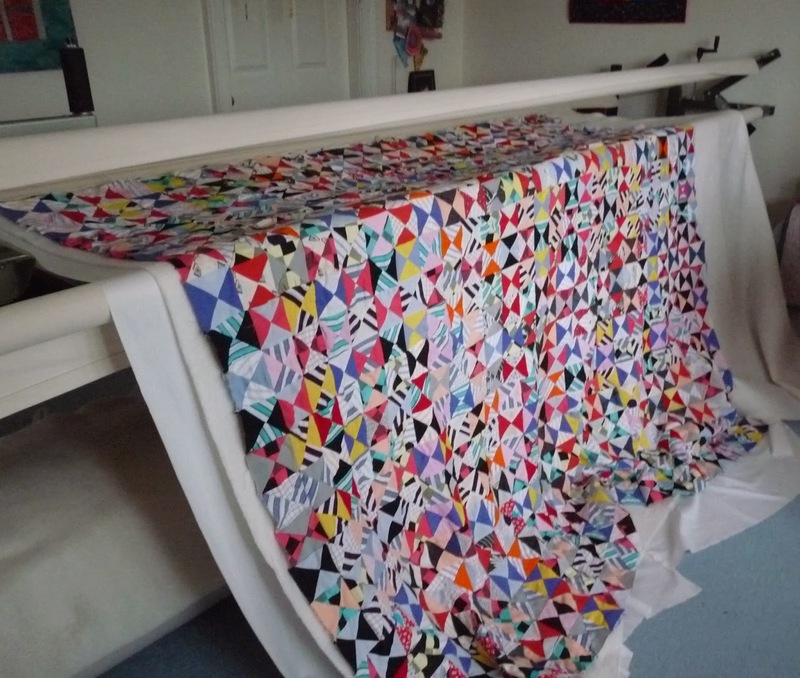 The odd angles meant that square corners weren't really an option, so after the go-ahead from Sandra I cut each corner on a curve before binding the edges of the quilt top with a faux-piped binding in complementary fabrics. Hopefully it won't go back into its carrier bag! ...only really become apparent when twenty people turn up for Stitch and Chat and you realise your kitchen table will fit on the end of your dining table. Living in a Vicarage means there are a lot of rooms to keep clean, but also that in those rooms you can squirrel away more chairs than you might realise, thus providing seats for lots of bottoms all at once! This was February's turnout. In January we had two dozen, so maybe I did something wrong and put four off this month? Most people here are being good and making what they're suppoosed to be making, which was an embroidered key holder, but a rebel on the end here was making 6" crochet squares. We let her off, on the basis that she's set herself the target of making a thousand squares before the end of July to yarn bomb the school where she's a Governor for their centenary. In January I taught her how to crochet, so really this is quite a task. Don't worry, we're all helping her, she won't be making all one thousand on her own! Next month we're making the cute little mouse I showed you in January. I'm preparing lots of kits, just in case hoards turn up again, but there may be mice for sale in Donna Marie's if we have a wet and windy night and people stay home! For Sandra ... and for Sandra! For one Sandra at work (there seem to be many Sandras at work), a custom order. Sandra wanted a little house design embroidered and appliquéd in very pale shades of cream on a cushion cover. ...and borders for the cushion front. For another Sandra, a little tease. This is definitely still a work in progress and a huge job, but it's got a lovely story and deserves a post all of its own, so watch this space! 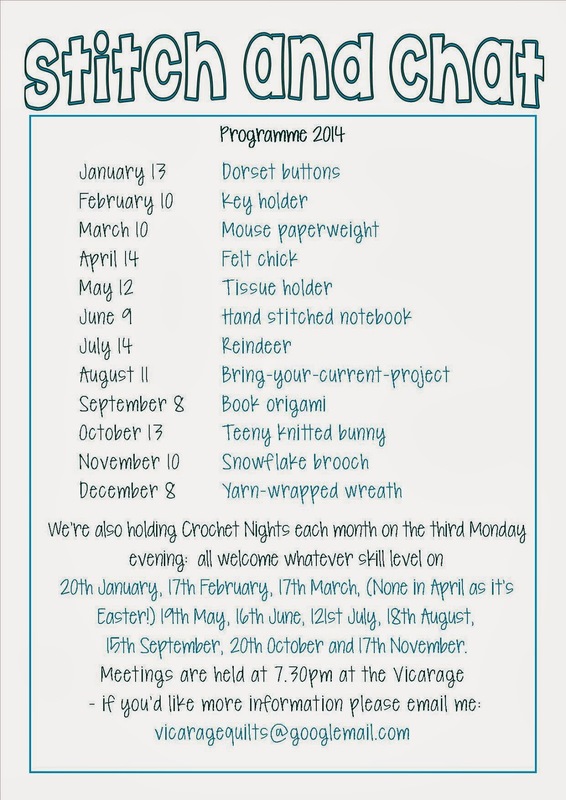 A busy month has resulted in fewer finishes than normal - the programme is ready though for this year's Stitch and Chat meetings. In January there were 24 of us which was a bit of a squash - for some reason (showing two dozen people how to make Dorset buttons, perhaps...) I didn't think to take a picture of everyone but if February is as busy I will try to remember! Not sure where the Christmas posts went, sorry about that: hope you had a lovely time; we enjoyed time with family and the holiday has flown! Back to work tomorrow, so getting everything ready and doing a few final preparations for this year's Stitch & Chat projects. The little fella above is an adaptation of the owl we made a couple of years ago so look out for him this year: when I've decided on the full programme I'll pop it on here. Send me an email to say hello - I'll email right back! You can follow me on instagram by clicking the button - easy!